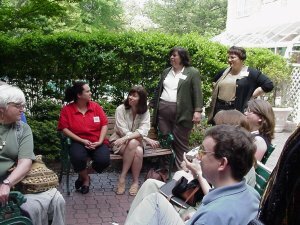 Celebrate Romance celebrates the kinship of romance readers and authors who have met through the wonder of the internet, providing the opportunity to meet in 'real time'. It is also provides an unparalleled forum to share the mutual enjoyment of the genre, and gives readers the chance to discuss with authors what makes reading a romance a pleasure -- and what doesn't. CR (as it is fondly called) is a self-supporting gathering, whereby all the attendant catered activities are covered by the individual registrations. All activities are run by volunteers, from the planner onwards. We do not have sponsors to help offset costs, so it is important to keep in mind that every attendee must pay the same registration amount to help defray expenses. But it's always been worth every cent - everyone comes away with so much, not the least of which is priceless memories. Registration deadline has passed for CR2003. Watch for news of CR2004 in the fall! We invite you to join us at CR2003, our sixth conference and gathering! 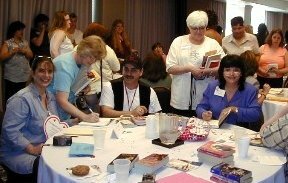 As always, expect to spend a wonderful weekend with friends new and old, readers and authors, this time in Sacramento, California. Registration is now open; follow the link to read the instructions. Then get your registration sent as soon as possible. We want you to be there! Note: It is required of all attendees or potential attendees to sign up for the CRNewsletter (link above). Without this email newsletter you won't be kept abreast of important information. Also, bookmark this page and check back for added details. Questions on CR2003? Write to cr@lanset.com. Replies will be sent as soon as is possible.